eBlox is proud to announce the launch of Leaderpromos.com, a top 50 promotional products and apparel distributor headquartered in Columbus, Ohio. Leaderpromos.com is a completely new web presence that showcases new features and technology for Leaderpromos’ clients, which includes top companies like Starbucks, Intel, Zappos and many others. First among these innovations is the Idea Board, a proactive tool that enables seamless, one-click saving of products for projects. Always just a click away in a floating tab on the site, Idea Boards can be shared with colleagues instantly or printed for presentations. In addition, eBlox streamlined the sample ordering process for Leaderpromos.com so that any number of samples can be ordered with a minimum of clicks. 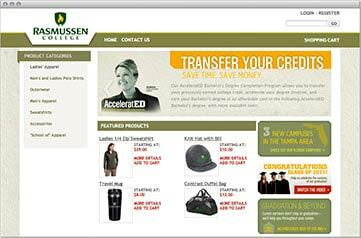 No login is required and sample ordering and management is consolidated onto a single, easy-to-use Sample Bag page. 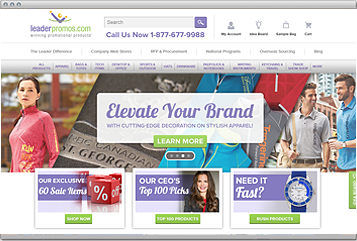 Built on eBlox’ storeBlox e-commerce platform, Leaderpromos.com is fully responsive for mobile devices, completely secured with SSL and packed with useful features like easy product color filtering and built-in blog posting. Check out Leaderpromos.com and give us a shout if you’d like to explore what storeBlox can do for your company. eBlox is happy to announce the launch of Print Synergies, a storeBlox 2 web site for the Carrollton, TX promotional products distributor and printer. 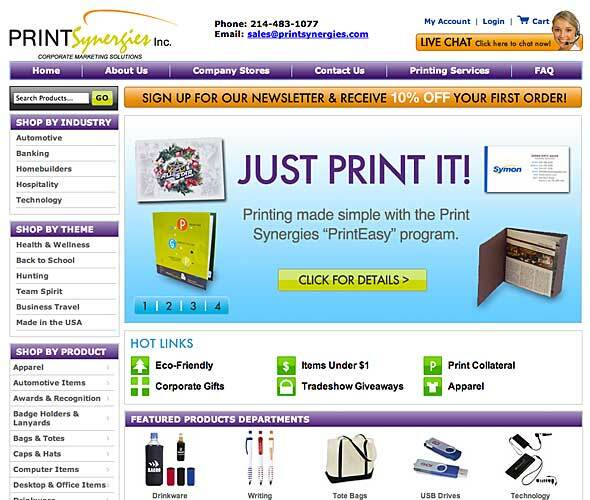 Printsynergies.com brings together a carefully-selected catalog of promotional products and apparel with extensive information on the design and printing services that the company offers. Like most storeBlox 2 sites, Print Synergies couldn’t squeeze their business into the “template” that so many other industry solutions force distributors into — the need to prominently feature design and print solutions mandated either a custom site or a very flexible e-commerce platform. That’s where storeBlox 2 comes in. Print Synergies also planned to launch with an SEO strategy with very specific performance requirements. In the process of interviewing nearly half a dozen SEO firms for the campaigns, Print Synergies had each firm vet all the e-commerce platforms they were considering. Once again, storeBlox 2 came out in front. With both manual and automated SEO capabilities, storeBlox 2 is the only industry solution for distributors and suppliers who are serious about search engine optimization. With special attention to existing branding standards, we developed a unique look and feel for Print Synergies, carrying through corporate colors, typefaces and existing branding, while delivering a completely new online experience for the company. It’s quite a nice upgrade. Check it out at Printsynergies.com. 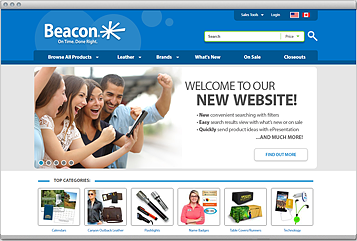 Few of us would call calculators fun – although I do recall enjoying a few upside-down calculator messages back in middle school – but the folks here at eBlox got a kick out of building calculators for two big site launches for 2011. Then again, we are geeks. First up is the product page calculator on the new 3M Promotional Markets website. 3M has always had pretty complex pricing and decoration options, so we actually took on the rather ambitious task of not only wrestling their pricing into a more structured model, but also building the ability to calculate that pricing accurately and quickly right on the product page. If that wasn’t enough, 3M threw in freight quoting as well – in real-time. So, we take product and quantity options, work out the total (including decoration) and then go fetch a real-time freight quote from UPS, all right there on the product page. You get an estimated total within seconds.All of this is made possible with storeBlox 2, the most flexible, customizable e-commerce solution for promotional products suppliers and distributors.